We are already past the one-month mark. That is craaaazy m’dear! This past week marked our first foray into using cloth diapers on you, and so far it’s going really well. Based on a really great review by Young House Love, we went with organic all-in-ones that are SO simple to use. We literally take the diaper off of you, drop it in a wet bag hanging from the side of our laundry basket, and then toss the entire bag with diapers in the wash every other day. Daddy was not excited for the change, but I think we’ve both been pleasantly surprised by how easy it is (plus it is good for the environment and a heck of a lot cheaper than those darn disposables!). It doesn’t hurt that you look super cute while hanging out in just a diaper now too! I have five different colors so I can coordinate with your outfits every day all well. You are better dressed than me, dear child. At your one month well-child visit yesterday, we found out that you have grown a full inch (22″) and gained nearly two pounds (9#13oz) since your low when we brought you home. You still feel tiny to me, but when I look back at pictures from those first few days, I can definitely see so many changes already. It makes me a little happy and a little sad, all at the same time. We love you so much, little girl! Glad you found a pacifier, Emily will only take Dr browns. I need to hear more about cloth diapers! Such a little ham in that first picture. Glad her checkup went well yesterday! Those little legs look strong! 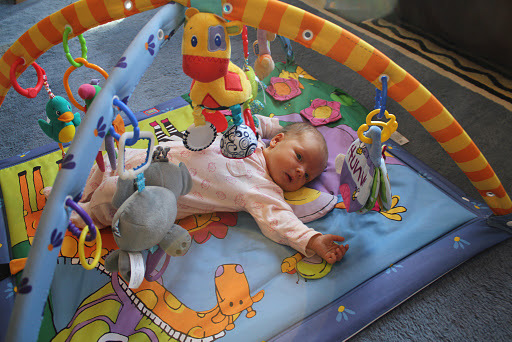 We're not liking tummy time either… or the playmat. But we are content to stare at the ceiling fan:] Fun times. Love the pictures and udpates! What a gorgeous quilt! And yay for playmat time!!!! Such a doll, that Stella. 🙂 Man, these lil' baybee pics make me so nostalgic. Sigh. We use BG AIOs, too and love them. They were the ones we originally bought for daycare because they were so darn easy. Even the daycare peeps–who were suuuper reticent about having to deal with CDs–later told us how easy and cool they were. We've added lots of other styles/types to our routine over the last year. And yes, it is shockingly easy, and especially so once you nail down your laundry routine. Go you! Love the quilt! I can't believe she is already over a month old! 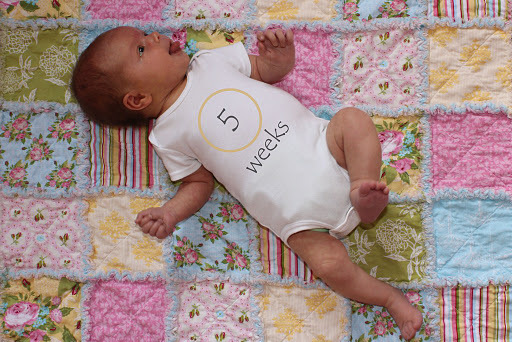 Glad her appointment went well and that you are loving the cloth diapers. She is adorable! Those play mats are awesome, just bought two separate ones for two different friends expecting! She looks too cute in her diapy! 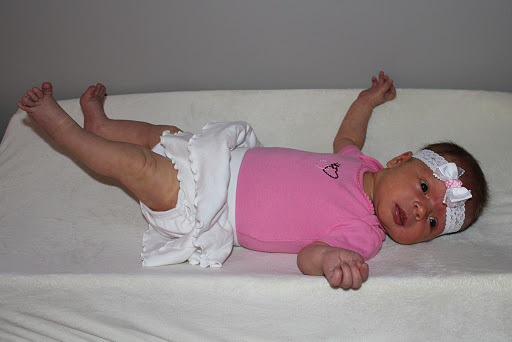 Thank you so much for posting your info about cloth diapering! DH and I were on the fence but after reading your post and the post you linked, we are about 95% certain we are going to go cloth! She looks so long, she is growing so fast! I like those cloth diapers. DH does not want to use those but I think I can change his mind by showing how much money we can save. Thanks for sharing!